Chapter 6: "City of Locusts"
The Wrath of the Righteous Adventure Path concludes with “City of Locusts,” a thrilling climax by fan-favorite author Richard Pett! The heroes of the Fifth Crusade have risen to heights of power undreamed of and have dealt blow after blow to the demonic armies of the Worldwound. As they return to Golarion from the Abyss, though, they find that their enemies are no longer sending minions after them—they've drawn the attention of not only the leaders of the Worldwound, but that of their demonic patron, Deskari, Lord of the Locust Host. The method for closing the Worldwound permanently lies within the heroes’ grasp, but in order to do so they must venture where no crusader has ever returned from intact. They must enter the crumbling City of Locusts to defeat its demonic ruler, but even this is but a stepping stone to the final battle against Deskari himself! 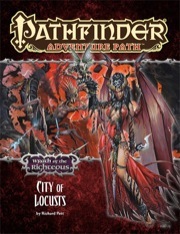 “City of Locusts” is a Pathfinder Roleplaying Game adventure for 18th-level characters who have gained nine mythic tiers. The adventure utilizes rules from Mythic Adventures in order to portray a campaign of truly epic potential. An exploration of the apocalyptic cult of Deskari, along with an article filled with suggestions for how to both continue this campaign and to launch a new one in the transformed Worldwound after the heroes succeed (or perhaps fail) round out this volume, along with a bestiary of several monsters (including the final demon lord to be presented during the campaign!) and part six of Robin D. Laws's Pathfinder Journal novella! For the conclusion to an epic AP, the story of this leg of the AP feels oddly uneven. Parts feel appropriately epic -- the PCs fighting the Storm King, and working to permanently close the Worldwound. But other parts feel oddly out of place -- the players are supposed to spend a while working through a demonic brothel whose entire staff and clientele combined couldn't come close to threatening a single mythic PC at this level, and the lead-up to the finale is... a dungeon crawl filled with a number of high level mythic opponents on a par with the Storm King, who I guess were just sitting around for some reason?... An unfortunately anti-climactic way to wrap up the story in this AP. As with the previous legs of this AP, most of the encounters in this AP are far too easy for mythic PCs. Happily, the gap here is a bit less than it was in books 4 and 5 -- for the first time in this AP we get a couple encounters that are probably too difficult for non-mythic PCs. Unfortunately, these encounters are still trivially easy for mythic PCs. 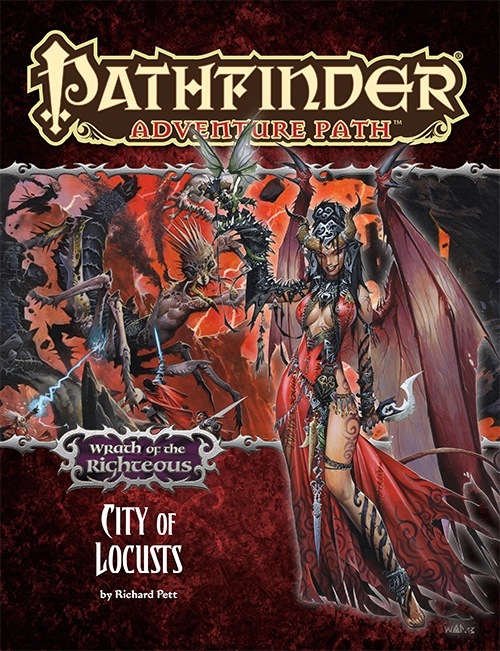 City of Locusts was a satisfying and exciting end for a fantastic adventure path. Its pace is quite fast, so PCs had better be ready to fight, and fight hard. Drezen will be pretty much under constant attack, so the more troops and allies PCs have managed to make, the better off everyone will be. Even NPC companions from the first adventure can be of help in this final installment. Encounters with the final villains of Wrath of the Righteous may prove to be emotional for players. The battle with the Storm King was deadly and horrifying. He may be one of the most powerful opponents ever encountered in an adventure path. Areelu was also a dangerous foe, and her destruction will be satisfying for any PCs who have been personally hurt by her actions. The saddest and most unexpected battle was against the fallen spirit of Terendelev. Our players were heartbroken to know their rescuer had been suffering this whole time. By the end of the adventure, players will be very pleased with all they’ve managed to accomplish. At 20 levels and 10 mythic tiers, characters will be as strong as they could ever hope to be. The module even offers advice for what such mighty characters may want to do next, such as start their own kingdoms, organizations or religions. I love adventures written by Richard Pett. His vivid descriptions of locations, characters and bizarre treasures are always a delight. This was a solid finish for one of the best APs they've put out yet. Challenging PC's of this level isn't easy, but the Storm King made us sweat. This final adventure has so many nasty ideas stirred into the mix, yet it still moved the story forward to the satisfying conclusion. I was sorry to read that there won't be anymore Mythic APs. My disappointment is only deepened by how well Wrath of the Righteous came to its end. This is one of our top campaigns. Only Shattered Star and Crimson Throne come anywhere close. The players faff about in a brothel that's too low-level for them. Then they go to a tower and solve a mystery literally every single one of them should have already figured out, find a magical macguffin, fight ANOTHER succubus queen (as if the last four weren't enough) and then... don't even fight Deskari. Worldwound closes, peace and eternity I guess, Queen Galfrey, like, retires?? Just steps aside so a real man can do the job a lady couldn't handle or something. Meanwhile, Deskari derps around in a pocket dimension. Too bad fighting him was "beyond the scope of the path"! You know what I - and especially my players - would have rather done than go to a wildly out of place succubus brothel? Fight Deskari. That would have saved you some precious page room, Paizo. And gah, that brothel! WHY? A brothel out in the ruined wastelands that supposedly caters to "only the most elite of the elite" and "has something for everyone, even the rarest taste" - except it has 5 chicks, with 1 disguised as a dude I guess. Really? I mean, Paizo is really progressive in a lot of ways, but there's starting to be a clear, sorta creepy hang-up about having anything sexual being exclusively portrayed by women (roughly a ratio of 99% at this rate). I dunno, I just find it really, really, really hard to believe that anyone at level 15+ could give a single fig about this brothel, much less two. And it's out of place, so much so that the whole pace ground to a halt and people in my play group had to constantly ask me what they were supposed to do, why were they there, why weren't they out doing more productive things? They were too powerful for any of the brothel encounters so they weren't afraid of fighting, and too good to be inclined to consort - at all - with some clearly, CLEARLY evil demons. I'm so mad, because if this had been in Midnight Isles, it would have still been a remarkably lame, tame, and boring brothel, one you could take your grandmother to it's so conventional (hardly fitting for "the exclusive delight" of the entire Deskari host), but it would have made sense. Well, at least, more sense than popping up and grinding the entire campaign to a halt. Then some other encounters happen, nothing noteworthy or meaningful, then you fight Arelash or whatever and she's basically the exact clone of any succubus boss ever (one you may have fought twice already, if your players - like mine did - angered Nocticula). Then that's it. The macguffin saves the day, your players don't even need to solve a single puzzle, the end. It's remarkable how unsatisfying an ending this book is to a campaign. tl:dr - Even if you bought every other book in the campaign, don't buy this. You can use random monster generators to make better encounters and there is nothing at all that matters in this book. Really loved this book, The enemies are suitably epic in feel and the plot itself for me at least worked really well (Also a lot better than the goddess incident from the previous book which is always a plus. Oh my this is gonna hurt. A thought occurs. This AP is probably going to get the PCs to level 20, and I think I heard Sir Jacobs say that they'd hit tier 10 too. I imagine the focus will be on starting new campaigns in the aftermath of the adventure path. Because you're right. As far as levels/tiers go, it's as high as it gets. Pett + Level 20 + Mythic Tier 10 = Pain. So, so much pain. Equal amounts of Win, too, but PAIN. This is like dropping a flaming piano on someone from a great height, except the piano is full of crazed miniature monkeys with chainsaws, and those chainsaws are on fire, too. Wait....*checks date for previous AP* Are you releasing two chapters of an AP in the same month?! or is that just a typo? The release schedule is still pretty tentative right now, but for the time being it is not a typo. O.O Woah. Talk about orienting the AP schedules a month earlier. It would be nice though to have an AP end and a new AP begin around the end of one year and the beginning of another. though considering the phrase "time being", that could change. You're probably right, but in a different way than you mean it. This is Pathfinder turned up to eleven thirteen. O.O Holy Crap! He's right! I wonder what the article will be called if it's not Continuing the campaign? Why? What do you think would four (or more) player characters at level 20 and tier 10 with player equipment be able to do? They'd easily smash every government on Golarion. They'd probably kick every villains tuchas, too, including such fan favorites as Tar-Baphon, all the Runelords (probably at the same time) or romantic duo Geb and Nex. "Continueing the campaign" would mean "rewriting Golarion as it is". Getting the characters to another plane where they can be suitably mythic without upending the whole setting seems the reasonable thing to do. Seriously, imagine if Golarion gets updated in a few years (yes, yes, "if", "in a few years", there are some caveats in there) and we already have the problem that now we got a lot of very high-level characters running around, probably do-gooders, which is definitely not the case on present day Golarion, where mostly evil people get to be high level. This changes the entire setting, unless the writers choose to just ignore that new reality. And one of those groups of heroes is said group of lvl 20/tier 10 superheroes. I don't expect characters as those to retire and open taverns in remote locations, so either they are the new movers and shakers in the world... or they have been removed to a location which keeps the setting intact. "Let's go pay Asmodeus a visit..."
It might as well be considering that Iomedae will fight to free Cheliax from diabolic control after the worldwound. See her article in CoT part two for evidence. That would be cool. I can imagine House Thrune pretty much crapping themselves once they realize a party of level 20s/MT 10s are headed their way. That, or they can go to Geb and finally put Arazni to rest. ...Pett is totally going to TPK everyone at the end of this thing. So does that then mean that the Worldwound is going to be closed in the canon of Golarion then? In the case of the end of this adventure, yes. But the world setting is not affected by the events of adventure paths, so the worldwound will not be closed in later volumes referencing the region. Until one day the setting timeline is advanced, if ever that happens. The Jade Regent Adventure Path also assumes that Rise of the Runelords happened, and I *think* that Shattered Star also assumes that Curse of the Crimson Throne happened. We'll be talking SPECIFICALLY about the topic of what it means to world canon in the last WotR I suspect, since it's going to have some significant changes on the world no matter what the PC's level of success is. But yes. Basically...it's only canon to YOUR would once your group plays the adventure. No other adventure is assumed to have occurred in Golarion yet, which means that someone who comes to Golarion today has only to buy the Inner Sea World Guide to be ready to go with pretty much ANY of our other products. That new customer doesn't have to read through 6 years of books to get caught up. And perhaps more importantly for us developers... neither do new freelancers. You would know better than I, of course, but I always assumed that with Jade Regent, Rise of the Runelords MIGHT have happened, and that the thing the two had in common was more related to some of the NPCs than the actual storylines, whereas Shattered Star assumed that Rise of the Runelords and possibly Curse of the Crimson Throne DID happen. "An army of 1,000 Hellknights at once? We just killed SEVEN demon lords, pal. Shattered Star assumed that all three of the original Varisia Adventure Paths happened, there are references to certain of the events in Second Darkness as well, just not as overt as the references to RotRL & CotCT. Wait, Mythic characters become "Immortal" at Tier 9. But there are certain methods of killing them that do work. Is it possible that Deskari might have to kill the PCs more then once? Because it might lead to the party having to keep "re-spawning" and coming back, which has the potential to be either hilarious or annoying. He could coup de grace them to death. Or use an artifact, which is much more likely. I suspect that Deskari will have an artifact of some sort. Otherwise, the PCs will just respawn. On the other hand, if they respawn and their bodies are still in Deskari's possession, ready for torture and to be bled of their mythic power like Rasputin tried with Dear Grandmother, well... Baba Yaga has 10 Mythic tiers. A party of four or five people with forty tiers between them? Delicious mythic supercharging for Deskari. I'm pretty sure you'll be going there with a big honking artifact weapon to put him down for good. Likewise, a demon lord of his strength will have a big honking artifact to bring people down on his plane.